Sohae Launch Facility, North Korea, Nov. 26, 2012: This satellite image of the Sohae Launch Facility on Nov. 26, 2012 shows a marked increase in activity at North Korea's Sohae (West Sea) Satellite Launch Station. This activity is consistent with launch preparations as witnessed prior to the failed April 13, 2012 launch of the Unha 3 (i.e., Universe or Galaxy 3) space launch vehicle (SLV) carrying the Kwangmyongsong 3 (i.e., Bright Lodestar 3). Given the observed level of activity noted of a new tent, trucks, people and portable fuel/oxidizer tanks, should North Korea desire, it could possibly conduct its fifth satellite launch event during the next three weeks (e.g., by mid-December 2012). North Korea may be preparing to attempt another rocket launch in the next few weeks, new satellite imagery suggests. 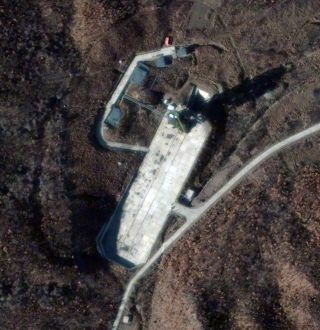 The photo, which was taken Monday (Nov. 26), shows increased activity at North Korea's Sohae Satellite Launch Station. The hustle and bustle is similar to that seen before the rogue nation's failed long-range rocket launch last April, according to satellite operator DigitalGlobe. "Given the observed level of activity noted of a new tent, trucks, people and numerous portable fuel/oxidizer tanks, should North Korea desire, it could possibly conduct its fifth satellite launch event during the next three weeks (e.g., by mid-December 2012)," DigitalGlobe officials wrote in a statement released with the new image. Though it has tried numerous times, North Korea has not yet succeeded in placing a satellite in Earth orbit. Last April's attempted launch of an Earth-observing craft atop the nation's Unha-3 rocket was just the latest failure, following similar flops in 1998 and 2009. North Korea's past launches have drawn condemnation from the United States, South Korea and other nations, which viewed them as thinly disguised missile tests. The West's concern stems largely from North Korea's famous unpredictability, along with its status as a nuclear-armed nation. The country is also highly secretive, making it difficult for Western observers to follow its activities or divine its motives. North Korean missile technology traces its origins to Soviet Scuds, which apparently entered the country via Egypt in the 1970s. Since then, the Hermit Kingdom has been developing bigger and more powerful rockets, some of which may have the potential to reach the West Coast of the United States.